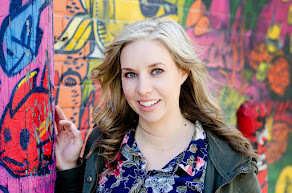 Simply Shaunacey: TBB asks - Holiday Edition! 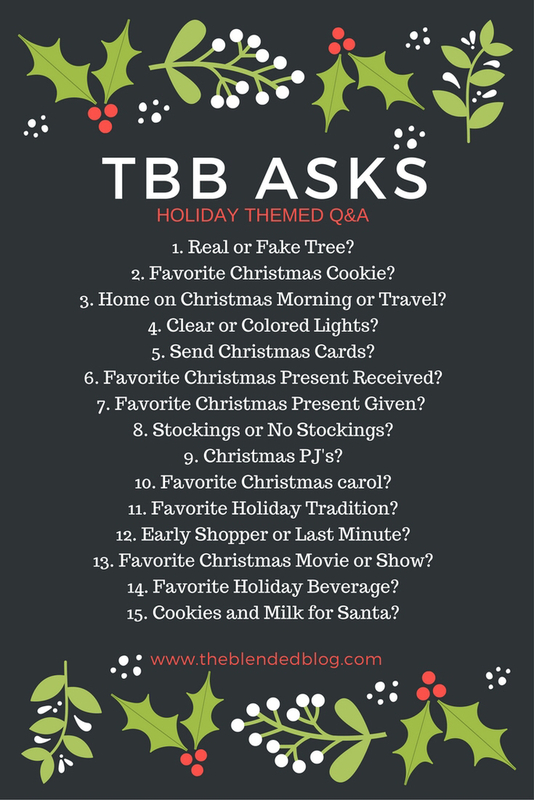 TBB asks - Holiday Edition! 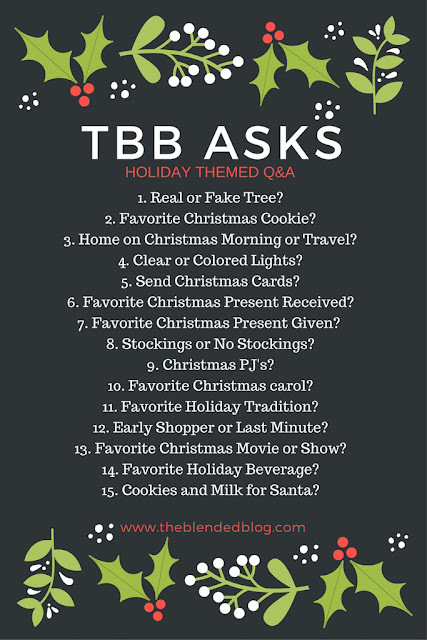 Another edition of The Blended Blog asks and we're going Holiday style! Feel free to copy the graphic and give your answers and link up your post with us at the bottom! 1. Fake tree :( We ALWAYS had a real tree growing up and I hope to get back to that BUT with super small kids it just seems more feasible to have a fake free right now. I do look forward to creating a tradition where we all go to the tree farm and pick and cut down our own tree. For now, we just get the box out of the basement and spread the branches lol It's even pre-lit so, ya know, as easy as it gets lol. 2. Without a doubt it's Cookie Brittle. I believe some people refer to this delicious goodness as "Christmas Crack". Ya, there's a good reason for that, it's highly addictive. Give me all the brittle and no one gets hurt. 3. Home. We usually spend Christmas Eve at home and then the travel starts BUT this year we actually have NO PLANS Christmas day!!! WHAT?! I can't wait to just chill with the kiddos. We might not even get dressed. PJs for ALL! 4. Clear on the tree, coloured on the house. Although, we don't technically have lights on our house. Last year our neighbours bought one of those lights that shines on your house and angled it so it covers both our houses. It looks like we put in some effort when, in reality, we did absolutely nothing. We lovingly refer to this as "the Christmas light". 5. Some years I send Christmas cards and some years I don't. This is a "not so much" year. I wanted to but it's rare I get enough time to shower, let alone fill out Christmas cards and get them where they need to go. There's always next year and if it helps, I do feel kinda bad about it. 6. Um can this year's count and doesn't it matter that technically I bought it for myself? lol Seriously though, hubby and I usually buy a "house" gift and this year it was robot vacuum that was delivered yesterday. I am in LOVE!!! Actually, I was so excited about the thing my 4 year old named it "Love" hahahaha. I love Love. 7. I honestly don't know. I love giving gifts so I'll just say giving gifts in general. Nevermind, I think my favourite will be this year because we've sponsored a family through a local non-for profit agency. We'll never see them get the gifts but knowing that we're helping someone have a better Christmas is all I need. I'm hoping to have the kids help with this so they understand Christmas is NOT all about what we get but more what we give. 8. YES to stockings!! Who doesn't do stockings? They're my favourite thing! Also, if you happen to have ideas for Santa for a 2 year old boy's stocking, I'm happy to take notes for the big guy. 9. Christmas PJs all the way. No adult onsies though, so not practical if you EVER use the washroom. 10. Jingle Bells, obviously. I also love Silent Night. And Frosty the Snowman. Okay, it's possible I just love Christmas music in general. 11. We always got to open a present Christmas Eve. It was usually something pre-approved by mom (so it wasn't a big gift) but I just remember loving that so much. For our kids, their elf brings a little Christmas Eve box with some pjs and a book and some Christmas Eve treats. 12. Is it possible to be both an early and last minute shopper? I start early but I never finish til the last minute. Sometimes I feel like starting early equates to buying more. 13. National Lampoons Christmas Vacation and Elf. No question. Also the Grinch (both cartoon and feature length movie). Wait, and Love Actually. And The Family Stone. Alright, I just love Christmas movies and want to watch them all. All the time. 14. Non-alcoholic: hot chocolate. Alcoholic: coffee and Baileys. And wine, always wine. 15. YES milk and cookies for Santa, that guy works hard and deserves a snack. We also leave carrots for the reindeer (obviously). Alright, if we're being honest, we don't leave milk, apparently Santa prefers red wine lol. Weird. Hope you enjoyed learning about our holidays... would love to learn more about you and yours - link up below and answer too! Christmas Planner to the rescue!